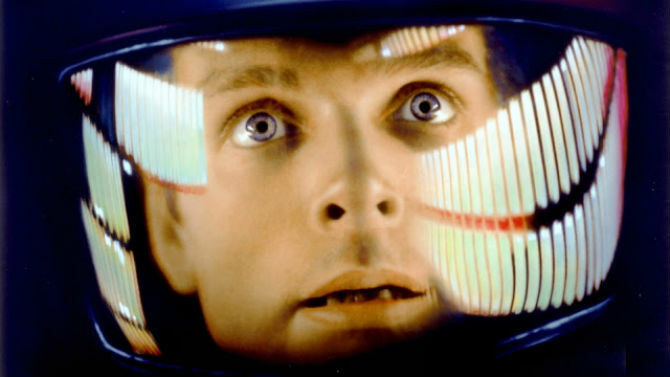 Forty-Five years ago today, cinematic history was made with the debut of Stanley Kubrick's classic film, '2001: A Space Odyssey.' Despite its subsequent success, the film originally wasn't well received. In fact, some considered it a disasterous failure. Of course the proof is in the pudding. It has since become one of the, if not THE most, influential science fiction movie of all time. And on a lesser note, the film has obviously been a huge inspiration to me personally! In celebration of this film, see Indiewire's article below on "5 Things You Probably Didn't Know About The Film." It's a cool list. "1. The Film Was Originally Called "Journey Beyond The Stars" - While it was based principally on author Arthur C. Clarke's short story "The Sentinel," the book "2001: A Space Odyssey" was actually written by Clarke at the same time as he wrote the screenplay with Kubrick. The duo originally referred to it as "How The Solar System Was Won," and it was initally announced under the name "Journey Beyond The Stars." Clarke wrote in his behind-the-scenes book "The Lost Worlds Of 2001" that they also considered "Universe," "Tunnel To The Stars" and "Planetfall" before landing on the eventual winner. 2. Kubrick Delivered The Film Sixteen Months Over Schedule, Having Nearly Doubled The Budget - Kubrick's last film, "Eyes Wide Shut," was a famously endless shoot, but this was not exactly something new. The famous perfectionist often went massively over budget and schedule, and particularly so on "2001: A Space Odyssey:" he went over the $6 million budget by $4.5 million (roughly equivalent to $25 million today), and arrived sixteen months late. Which should be a comfort to Andrew Stanton, if nothing else. 3. Seventeen Minutes Of Footage Cut At The Last Minute Was Recently Rediscovered - Given how much footage was shot (as much as two hundred times the length of the final cut), it's unsurprising that enormous amounts were left on the cutting room floor, but it's unlikely ever to surface: Kubrick always burnt his negatives after a film was finished. But the director did cut nineteen minutes after release, seventeen minutes of which were rediscovered in 2010 in a vault in a Kansas salt mine. It's yet to see the public light of day, but surely something is planned soon. Even aside from Peter Hyams' lesser 1984 sequel "2010: The Year We Make Contact," the tale's gone on to have life elsewhere. Clarke wrote two more novels, "2061: Odyssey Three" in 1987 and 1997's "3001: The Final Odyssey" (Tom Hanks reportedly picked up the rights to the latter with the idea that he might direct it). Perhaps most curiously, a decade after the film was released, Marvel produced a ten-issue series by comics legend Jack Kirby that expanded on the film. The series saw the first appearance of Kirby's robot superhero character "Machine Man," who would later go on to become a stalwart part of the Marvel universe. 5. HAL 9000 Actor Douglas Rain Reprised His Role...In Woody Allen's 'Sleeper' - The film's been much parodied over the years, by everyone from Mel Brooks to "The Simpsons," but few went to the same lengths as Woody Allen. When he made his science-fiction comedy "Sleeper," the writer-director-star wrote an evil computer into the climax of the film, and got none another than Canadian stage veteran Douglas Rain, who lent his voice to HAL 9000 in "2001," to voice it in an uncredited cameo. Watch Woody Allen talk about his first impressions and growing to love Kubrick's movie below." I knew about the original title, but didn't realize it was the same voice that was in Sleeper. Like Alex I had not realised the voice was that in Sleeper. I saw it when it came out at the cinema, I'd read the book, a know it all 15 yr old, who thought he knew everything-hell I'm not that much different now...And my abiding memory of the film is the two people in front of me saying as the credits rolled: "Did you understand that?" "Naw, it was a load of rubbish, lets go for a pint." I think the film needs to be seen on as big a screen as possible. I've watched it since on video and it wasn't the same. I actually liked 2010-again, I saw it at the cinema and I've not seen it since. It was a different movie but taken in isolation ok. I think the sequence of books that followed 2001 got less and less convincing. The last one I read where the astronaut who drifts off get found and reanimated a 1000 years later was pretty poor. but then i never thought Clarke ever wrote a believable character.